She and I were both fellows in the college’s Appalachian Sound Archives program. I’m hoping to use the archive’s radio programs, oral histories and other materials to better tell the story of the great Appalachian migration of the 20th century. Lynch-Thomason, of Asheville, N.C., was studying the audio recordings of Kentucky ballads which have mostly fallen out of oral tradition. She plans to build a singing repertoire of 25 to 30 pieces to revitalize the rare stories and melodies in Southern Appalachian singing communities. You can follow her research on her project’s blog. The multi-media show also features labor ballads Lynch-Thomason sings while narrating the story of Blair Mountain, the site of one of the largest civil uprisings in U.S. history where miners of the West Virginia Coal Wars fought a bloody battle against coal operators for the right to form unions and receive fair wages, among other benefits. Lynch-Thomason also assembled a stirring melange of pictures to illustrate the historic events. Lynch-Thomason produced the show and a CD of the same name to raise awareness. On the CD, contemporary musicians cover 20 labor songs, which take the listener step-by-step through the main events and themes of the coal wars. The CD also features a fold-out map, which coordinates track numbers to the geographic sites of each historic moment and information on the Blair Pathways’ website. It’s an engaging, smart new way of telling an old Appalachian story. So when No Depression, my fave roots music magazine, published an interview with Lynch-Thomason, I was naturally stoked. The magazine has generously given us permission to run it here. So, what’s your background? Did you grow up in Appalachia? Saro Lynch-Thomason: Not technically, but certainly in the South. I grew up in Nashville, Tennessee, which is in the rolling hills of middle Tennessee, but my family, on both sides, stretches back several hundred years in Appalachia. So, I definitely feel very connected to the region. What brought you out to do this album? Do you travel out to the area of the West Virginia Mine Wars a lot? Saro: For several years, since high school, I have been working on mountain-top removal issues in Appalachia. I have become inspired to do this particular project because there is a mountain in West Virginia called Blair Mountain that is being destroyed due to strip mining for coal. Blair Mountain was the site of a historic uprising of about 10,000 miners and supporters back in 1921. So, back in June 2011, there was a week-long march that traced the march that the miners took during the rebellion and it was really inspiring to see everyone… the bravery and the versatility people had to have on that march. We got a lot of support from locals and there were some hard times too. I became interested in what kind of music had kept that original movement back in 1921, had kept those miners going and those communities strong. So, that’s why I started this project, by doing research into the music of those Coal Wars. Do those Mine Wars include Blair Mountain or were those earlier? Saro: Sure. Let me clairify. There are several different Coal Wars or Mine Wars that happened all over Appalachia, northern and southern. Some of the earliest ones happened in the 1870s up in the anthracite region of Pennsylvania involving a group of union organizers who are now referred to as the Molly Maguires. It’s happened anywhere where the coal industry has been dominant in Appalachia. The Coal Wars that this particular CD focuses on were in West Virginia and they occurred between 1902 and 1921. There were three main periods of conflict that I’m covering: one was strikes in 1902. The second was what are called the Painted Creek and the Cabin Creek Strikes in 1912 and 1913. Then, most famous are called the Mingo-Logan Wars from 1919 to 1921 which culminated with that march to Blair Mountain in August of 1921. What were the miners striking about for the most part? Saro: At a basic level, it was for dignified treatment. These wars are often looked at as wars for union recognition and they were. But, at a broader level, whether people wanted the union or not, they wanted to have dignity in their workplaces and in their home places. One of the main demands of the miners, every time they struck, was to eliminate the mine guard system which essentially meant that these folks were being guarded at work and being spied on at home by private spies and by armed guards that were hired by the coal companies. The minute that you started talking union or started talking about changes in workplace safety etc., you could get blacklisted and you couldn’t find any work in the coal field. These miners were asking for unions and, along with that, they wanted to insure that the mine guard system went away and that they could be paid in American dollar bills instead of in scrip which was a replacement form of money that they could only use at company-owned establishments. So, they were asking for several different things, but it all comes down to humane treatment and a life with dignity. Right. This might be a bit ahead of the questions but… do you feel that the issues now with mountain-top removal in Appalachia and the protests against it, are those still in line with the workers? Or, are the workers on the other side of this? Do you feel the movement to stop mountain-top removal is in the workers’ best interests and do the workers agree? Saro: In terms of what it means to have a dignified life in Appalachia, whether you’re a coal miner or work as a nurse or a homesteader, whoever you are… To have a life with dignity in Appalachia means to be able to not have the risk of getting cancer from the water you’re drinking or to live in a healthy environment, that’s not going to harm you because of the effects of practices like mountain-top removal. People are in a really challenged place because mountain-top removal pays better, in many cases, than other forms of income in parts of Appalachia especially West Virginia and parts of Kentucky. Union locals marched with us to Blair Mountain. A lot of miners are concerned especially in the UMWA itself is concerned, which is the United Mineworkers of America, is concerned about saving this mountain and is concerned about jobs. I can definitely say, it depends on who you ask but, if you look at, statistically, how many jobs have left Appalachia, especially because mining has become more mechanized, you could see that deep mining provides more jobs for people in Appalachia and the elimination of mountain-top removal provides for healthy Appalachians, no matter what you’re working background is. It seems that, back with the Mine Wars and Blair Mountain, that there were a lot more workers who were actively fighting, even physically fighting, for these rights. Does it seem that you’re not seeing that as much now that it’s really split and is that because the marketing is so much better by the proponents of mountain-top removal? Saro: There is definitely a very successful form of propaganda… Yes! (laughing) I think the myth that is perpetuated now is that it’s the tree-huggers versus the workers and that the tree-huggers can’t possibly understand or care about the economic needs of the workers. This is a total myth and it is definitely a way to divide and conquer and keep people from organizing, from unionizing themselves and also from communicating with people who are trying to do hard work around environmental issues in their own communities. This is part of the myth, that the tree-huggers are all from out of state or aren’t from here or are different economic backgrounds. In fact, the people who care about this the most are people who are living in the coal fields and trying to find out how they can keep their water supplies clean and also have a good job for themselves and for their families. These problems go hand-in-hand; they’re completely inter-related. The major myth that these companies tell their workers is that these problems are not related and that they should be ignoring the issues that they’re facing at home. Maybe we could back up and you could talk about mountain top removal. When did it come about? Why is it popular? There are some pretty obvious reasons why it’s a problem. Saro: Mountain top removal is a form of surface mining for coal. It began in the 60s in Appalachia and it involves scraping the topsoil off of land. You take off the topsoil; you take down all the trees and then you blast and create sidewalls along mountain tops in order to scrape out, with huge machines, the thin seams of coal. It developed as a way to get coal out of the ground faster; it developed as a way to employ less people and use a more mechanized form of production and it also developed because coal seams were getting thinner and thinner. The quality of coal and the amount of coal that is coming out of Appalachia now, and coal companies will tell you differently, but it is less and less. The quality of coal that is being mined now is what would have been thrown away by our grandfathers. It was not considered as good… what happens in the process, is that the coal, which acts as a natural filter underground, it catches and holds on to hard metals. All those hard metals are released into the water system. The animal, plant life and human life is all exposed to these hard metals, not to mention that when these mountains are gone, erosion and flooding become huge issues and people lose their homes. Flooding has become so much worse as a result. That’s just a few of the problems around mountain top removal. It makes communities sick and it endangers communities because of the waste that is produced. It seems that it’s kind of a short-term gain. It’s like clear-cut logging; you get something in the short term but you’re really killing the business in the long term. Saro: It’s definitely killing Appalachia. The recovery process… there’s no way to measure it. It takes countless numbers of years for that kind of topsoil and the complicated beauty of the forest to form. To take that all away, recovery takes so long. The coal companies will do things like spray, they’ll spray a hydro-seed, quite often of non-native, fast-growing grass across the landscape to make it look green so it gives a semblance of health but it’s trying to hide away the fact that this land has been devastated in a way that it can’t recover from for thousands of years. Let’s talk about the album. I really love the album. It’s a beautiful album. You’ve got a lot of really great artists as well. Are all the artists specifically from Appalachia or at least, deeply connected to Appalachia? Saro: Several of the artists are connected to Appalachia. People like Elizabeth LaPrelle and Brett Ratliff and Sam Gleaves, Riley Baugus, Wayne Erbsen. I would say the majority of the people on this album are connected to Appalachia. The folks that are from further places, from the Northeast or down in Florida etc., they all were really excited to be a part of this CD because of their love of that labor history or because of their sense of the environmental urgency, their love of the land of Appalachia. So, everyone had a different emotional connections to participate in this. Do you think that this kind of work is helping? I remember that Daniel Martin Moore and Jim James and Ben Sollee did that big album about mountain top removal. Did you see an effect from that and are you seeing an effect from this? Do you think it’s helping? Saro: I do. It’s all about how much the word can get out. The immediate satisfaction is the emotional reaction that it creates in people. Using music to tell the story creates an emotional validation, for people who really care about these issues and that’s a really beautiful part of this process. In terms of it making a real difference as a whole, I really hope it can teach people who are not aware of this history to become engaged with it through this music. I will be doing a lot of touring and other forms of promotion to get people to know that the story exists and that they can engage with it through music. Where did you learn the music and the songs? Saro: Some from CDs… but I also moved to western North Carolina about 3 years ago and have been studying off and on from local ballad singers. A good friend of mine is Bobby McMillon who is a really wonderful historian and ballad singer. I’ve gotten to learn directly from several people while I’ve been here and that’s been really wonderful. How did you pick the tracks? I love how each of the tracks somehow relates back to the mine wars. Did you choose the tracks or did the artists choose the tracks? Saro: I chose the tracks. It was a complicated process. I had a whole series of tracks, a bit longer than what ended up on the CD and, in many cases, was able to give artists a few different choices, saying, “Which one of these appeals to you?” And in most cases, there wasn’t even music for the musicians to listen to. They were just given a set of lyrics because a lot of these songs are sourced from old mine workers’ journals and that sort of thing. We might be able to guess what tune they were to, but we don’t have the music for it. So, I would give the artists a few different choices and ask them what inspired them more and then they’d choose a piece to do. Based off of that, I would move on to the next artist and figure out what part of the story they could cover as well. So, you actually went back and did a lot of research to find the songs. Saro: Yes, I did research through the West Virginia state archives and through the national archives in D.C. Fortunately, these labor wars are better known than some. A lot of books have been published on this history and those books provide links to music that was being utilized during these campaigns as well. The main question I really want to ask about the project is: What can we learn today from the history that you’re presenting here? What can this history teach us about what’s happening today? Saro: What captures me the most about this story is that these folks were driven to a place where they they didn’t feel like they had much to lose by standing up for themselves. They were working amongst people who were from incredibly different backgrounds from each other. There were Hungarians, there were Italians, there were blacks who had come up from farm work in the south, there were white Appalachians, there were young men from New York. These people are working in such diversity with each other and they don’t even know how to physically talk to each other quite often but they’re working in the same miserable conditions and they just reach a point where they know that if they stand up for their own dignity they’re going to potentially lose their lives, but it’s worth it. I think we can learn from these people’s willingness to overcome their differences and their misunderstandings across the spectrum of backgrounds and ethnicities and languages to demand what they deserved as human beings: to live with dignity. In our country today, we’ve been taught that we’ve been deprived of that history. We don’t know that exists and through that deprivation, we don’t know that it’s possible for us to reach inside and honor that spirit that tells us that we are able to ask for what we deserve. The story serves as an inspiration and tell us that as Americans we have that heritage if we choose to acknowledge it. I’d also like to thank Saro for bringing the amazing young Appalachian singer Sam Gleaves to my attention through his tracks on this album. 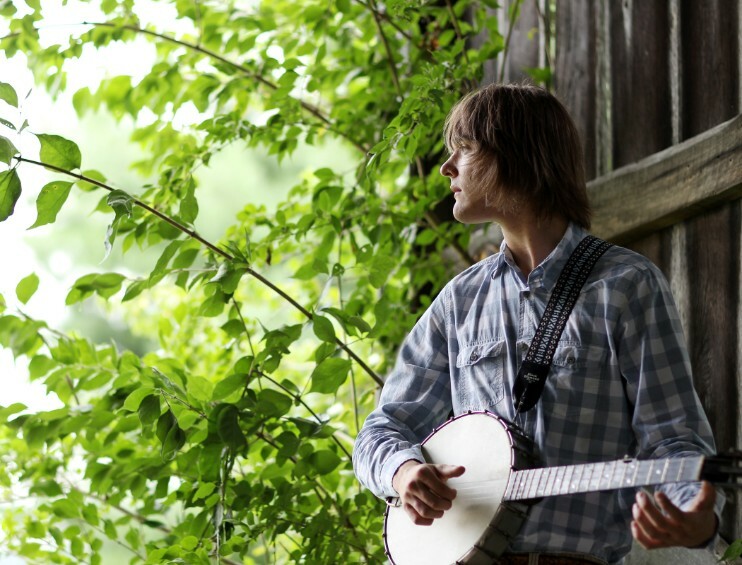 Sam Gleaves‘ new album, A Little While in the Wilderness, is a must-have for any fan of Appalachian music. A student of famed ballad singer Sheila Kay Adams (like Elizabeth Laprelle), Gleaves was born and raised in the hills of Southwest Virginia, so he should know the historical area of Blair Mountain well. He loves his home and takes its preservation seriously. When I shot him a quick email to get a review copy of the album, he emailed back and concluded with this heart-breaking little sentence: “Thanks also for celebrating Saro’s incredible work, I hope your review of it convinces more people that our mountains are worth saving.” Sam’s got a beautiful voice, and his album touches on both the unaccompanied ballad traditions of his home and the more raucous stringband traditions. He’s too young to be singing this well and with such authority and I hope more people will get the chance to fall in love with his music. Buy Sam’s album here. Hi–Is the Hillville still publishing? If so, like to get back on your mailing list. I just realized this is the last post I received! Hi Peter, We were on an extended hiatus, and have regrouped and are back at it. Thanks!